This is part 9 of a series on Vermeer’s and Rahmstorf’s 2009 PNAS paper, “Global sea level linked to global temperature“ (referred to as “VR2009″ in this series of posts). 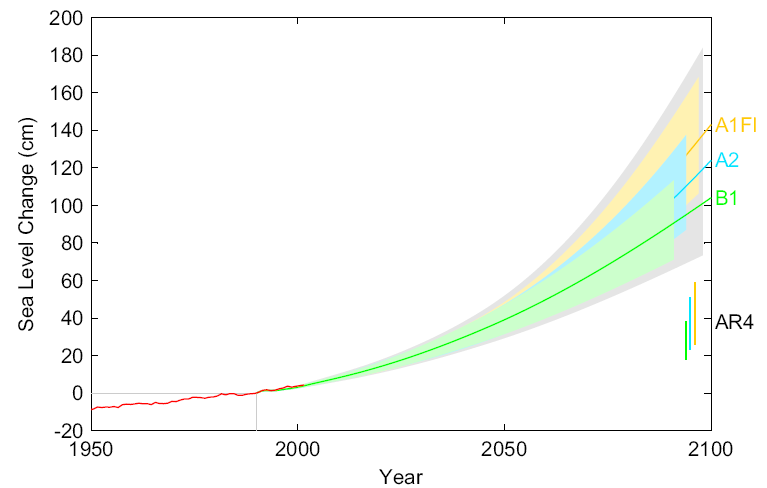 Naturally, Vermeer’s and Rahmstorf’s conclusions were scary: oceans rising by as much as 1.8 meters by 2100. Their results, with the imprimatur or the National Academy of Sciences, have been gleefully touted by those who crave the authority to reshape the economy of the planet to fit their more highly evolved ideals. A google search for the title of their paper, “Global sea level linked to global temperature” yields thousands of hits. 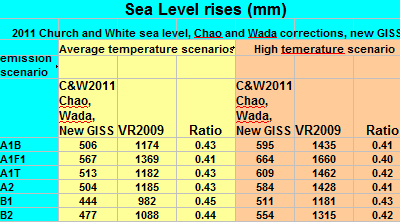 VR2009 used Church’s and White’s 2006 sea level data modified with Chao’s correction for artificial reservoir storage for sea level, H. For temperature, T, they ﻿used the GISS global temperature . They inserted them into the above model equation and found the values of a, b and T0 that yield the best fit. Then they inserted their values of a, b and T0 back into the model equation and used IPCC temperature scenarios for the 21st century to determine the sea level rise for the 21st century. 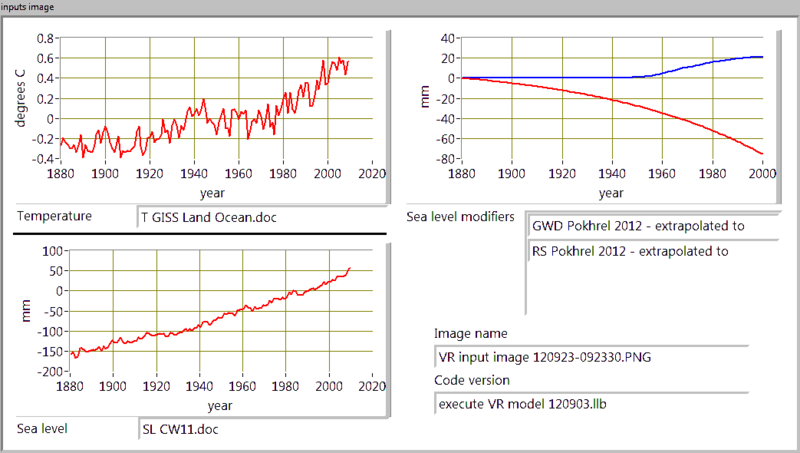 It turns out that the sea level data that VR2009 used was profoundly flawed. 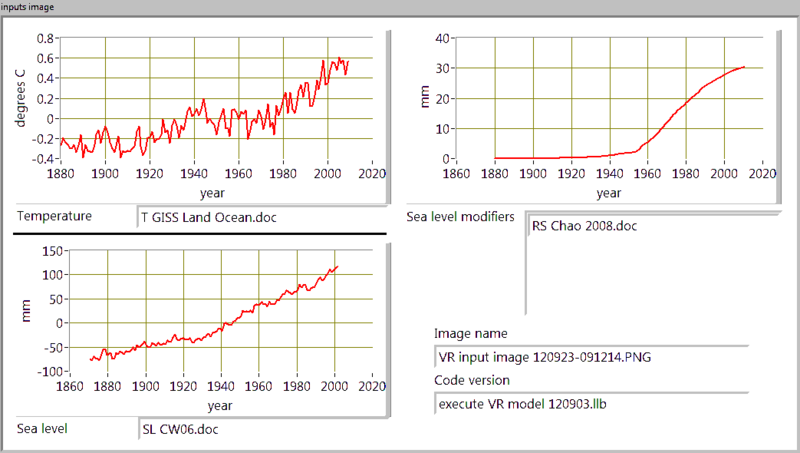 About the same time that the National Academy of Sciences published VR2009, Church and White updated their sea level data. 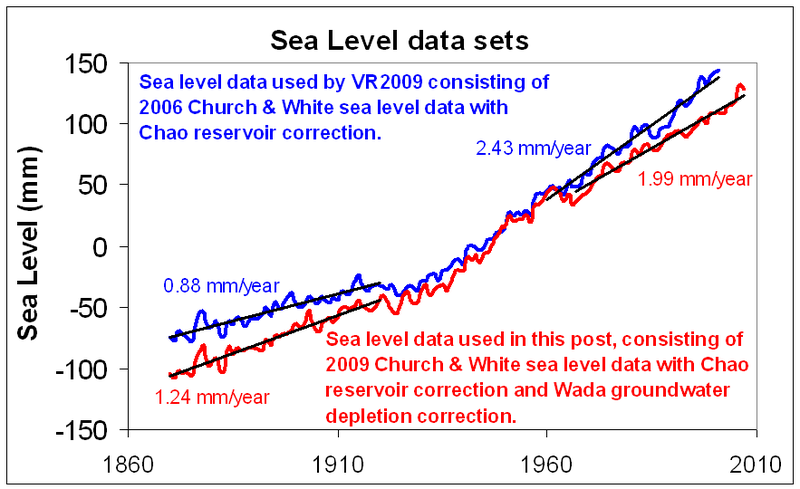 The 2009 version of Church’s and White’s sea level data extended the data out to the year 2007, but more importantly, it also incorporated corrections that drastically changed the sea level versus time for the previous 100 years. I have searched high and low for some acknowledgment of the updated Church and White data by Vermeer or Rahmstorf, but I have found nothing. VR2009 also gave short shrift to question of groundwater depletion. ﻿VR20009 included the Chao artificial reservoir correction to compensate for water that would have been added to ocean depth but has instead been stored in artificial reservoirs. 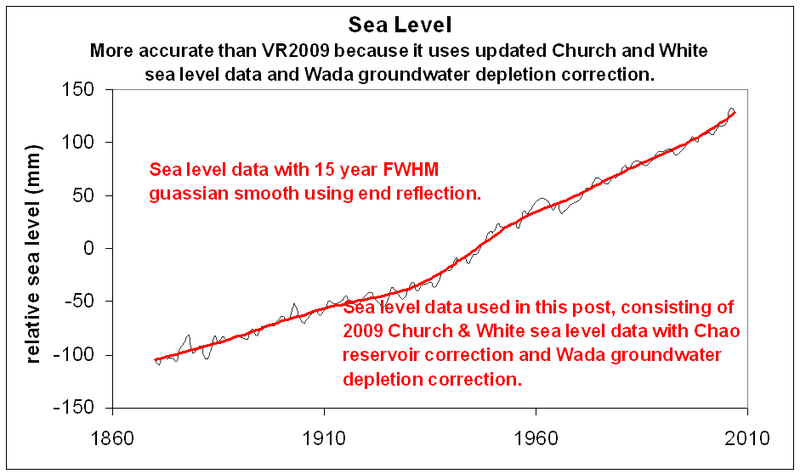 They were happy to add this correction to the Church and White sea level data. I was critical of Chao for not including the inverse effect of artificial reservoir impoundment: groundwater depletion. A correction for groundwater depletion would have to be subtracted from the Church and White data. I have also been critical of VR2009 for brushing this point aside by saying “No time series of this is available” for groundwater depletion. It turns out that I was right – in the last part of the 20th century groundwater depletion dominated artificial reservoir impoundment. 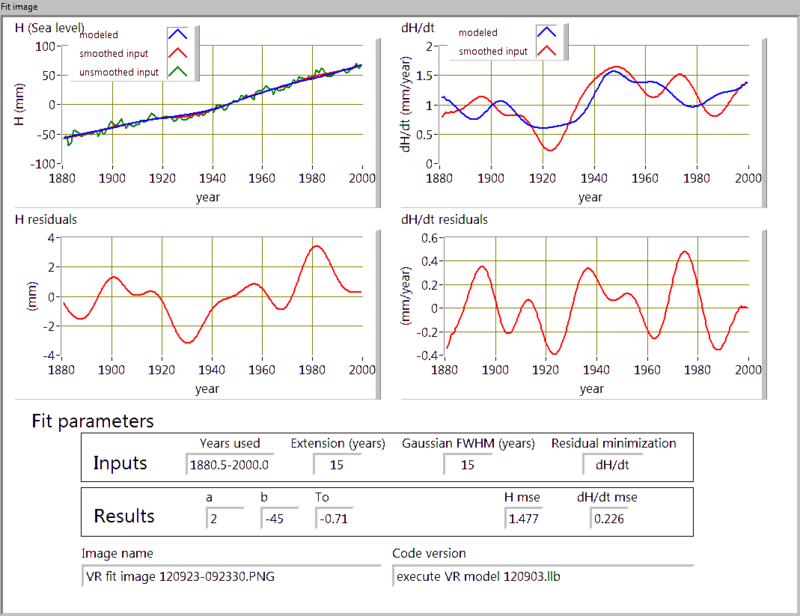 And now a time series IS available from 1960 to 2000. A new Geophysical Research Letters paper (﻿Wada, Y., L. P.H. van Beek, C. M. van Kempen, J. W.T.M. Reckman, S. Vasak, and M.F.P. Bierkens (2010), Global depletion of groundwater resources, Geophysical Research Letters) provides the necessary information. ﻿Wada provides groundwater depletion data covering 1960 to 2000. That data fits an exponential very nicely, so I have extrapolated it backward and forward along the exponential (see here for details). Correcting for either the updated Church and White sea level data or the Wada groundwater depletion data drastically changes the outcome of the VR2009 model. Taken together they destroy it. 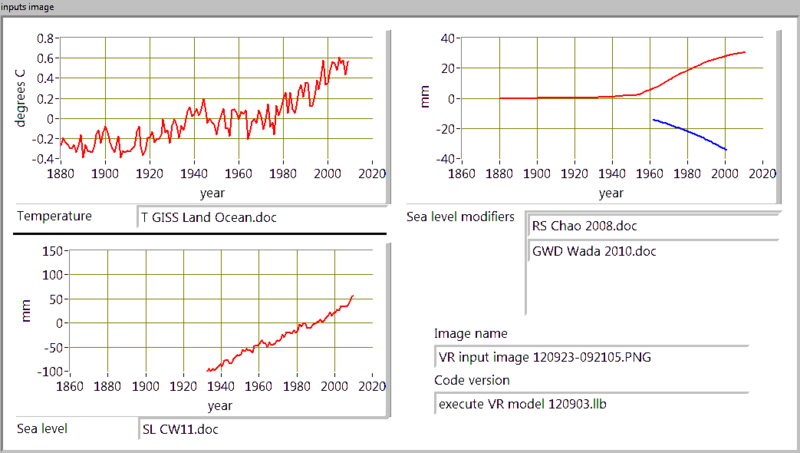 In this post I will use the updated Church and White data, a groundwater depletion correction based on Wada’s data, and the Chao reservoir correction used by VR2009 to create a superior time series for the sea level. 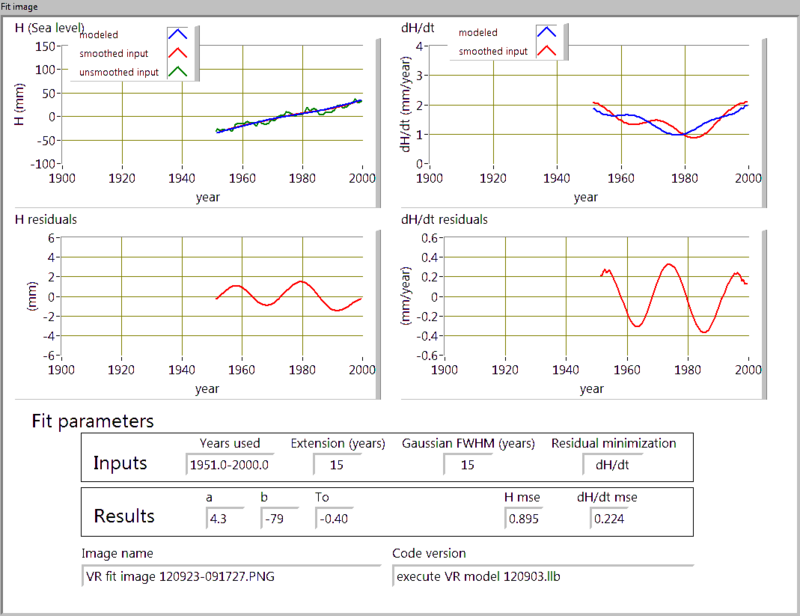 This more accurate time series will be used to re-calculate the values for a, b and T0 for the VR2009 model equation. Figure 1 shows the components of the sea level. Figure 1. Sea level components. Figure 2 is an overlay of the sea level data that VR2009 used, and the new, more accurate version created by combining the updated Church and White sea level data, the Wada groundwater depletion correction and the Chao reservoir correction shown in figure 1. Figure 2. 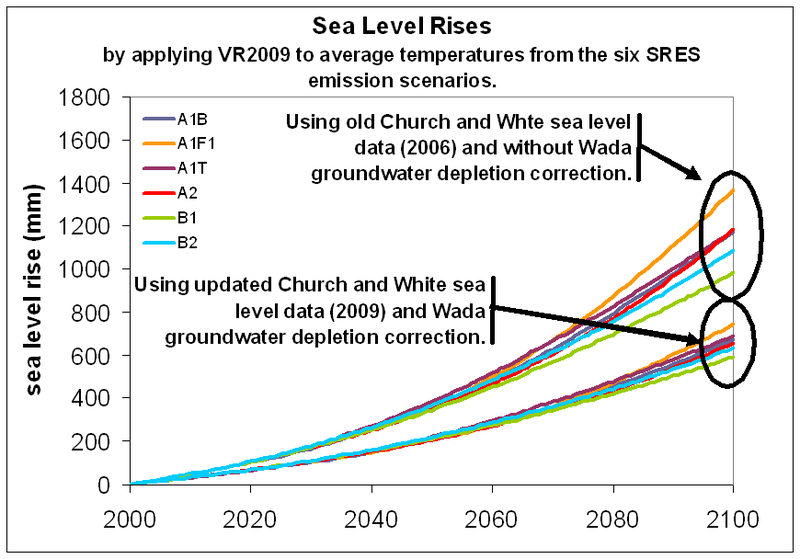 The VR2009 version of sea level data compated to the more accurate version using the updated Church and White data and the Wada groundwater depletion correction. Look at the difference. 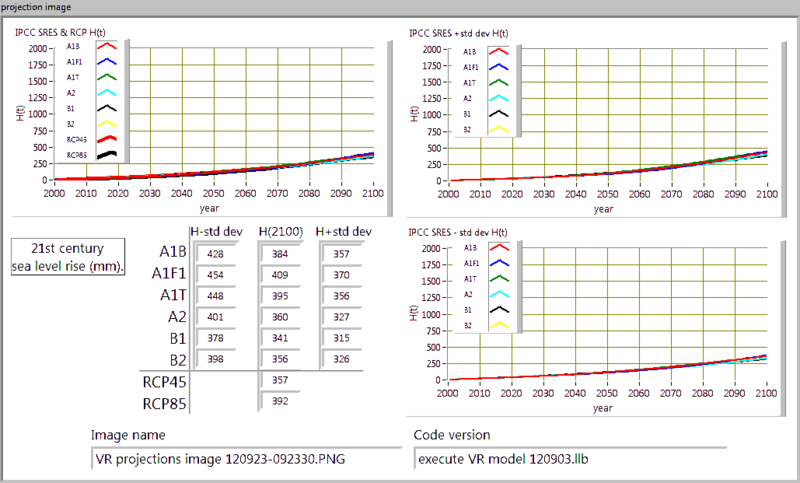 The VR2009 version of the sea level data starts with a lower slope than the more accurate version, but it ends up with a larger slope than the more accurate version. In fact, the slope for the VR2009 version increases by nearly a factor of 3, while the more realistic version increases by about a factor of 1.6 (see figure 3). Figure 3. 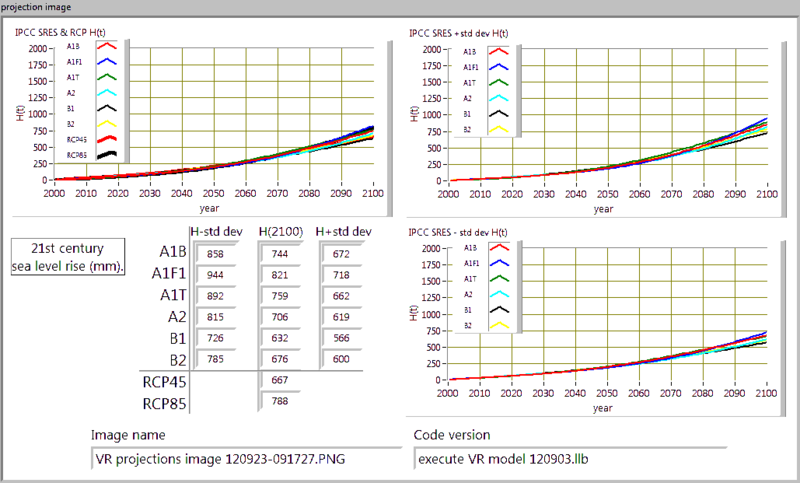 Beginning and ending slopes for VR2009 version of sea level data and the more accurate version used in this post. 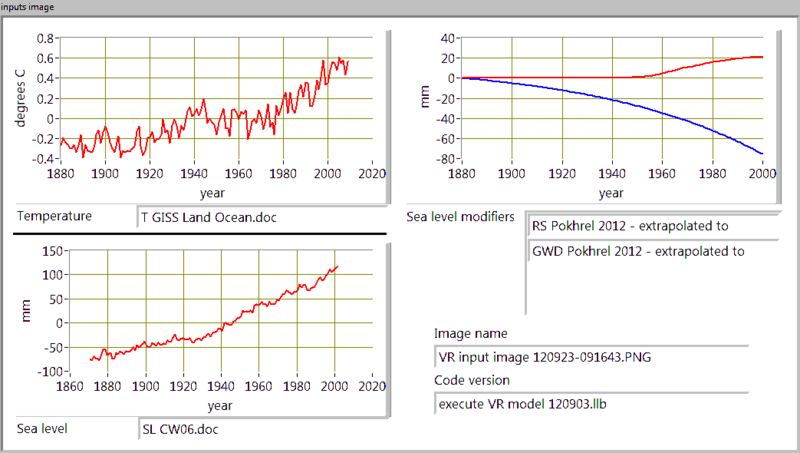 VR2009 smoothed their sea level and temperature data with a 15 year smoothing period. 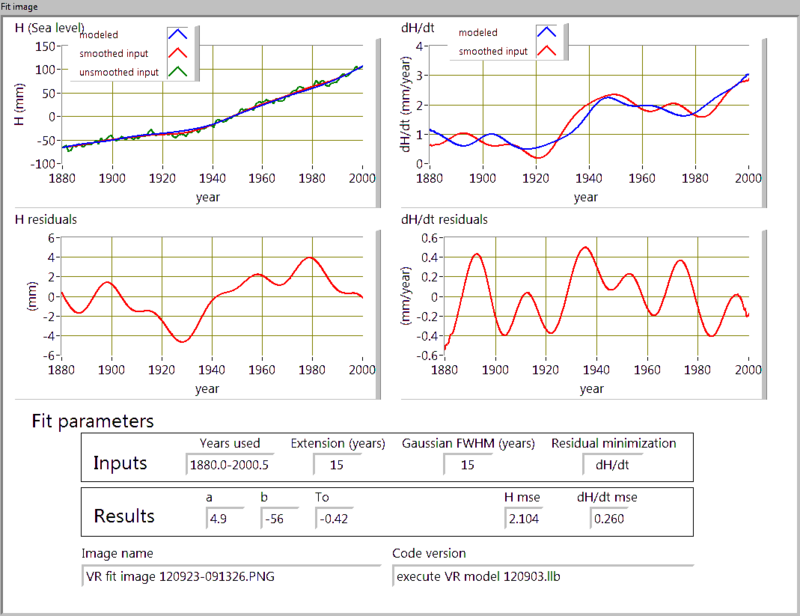 I will smooth them with a 15 year FWHM gaussian filter with end reflection. The smoothed sea level data is shown in figure 4. Figure 4. 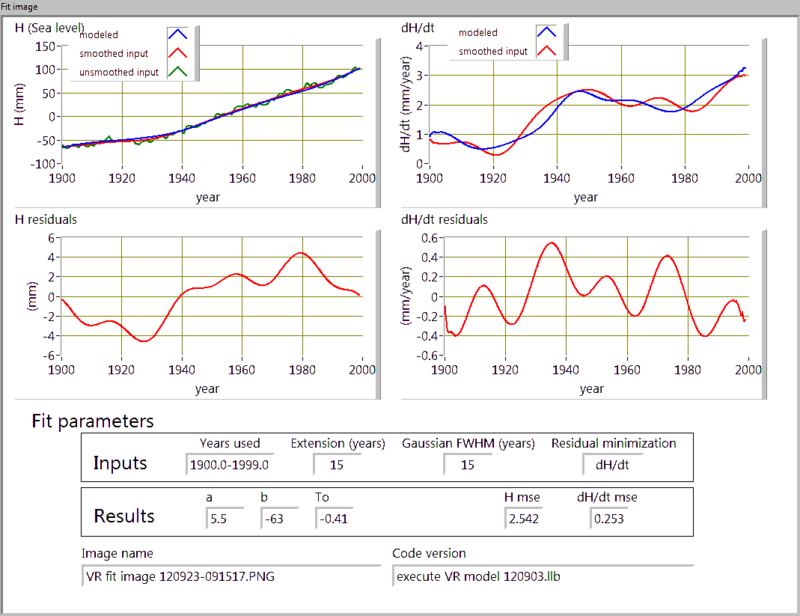 Improved sea level data with 15 year FWHM gaussian smoothing. 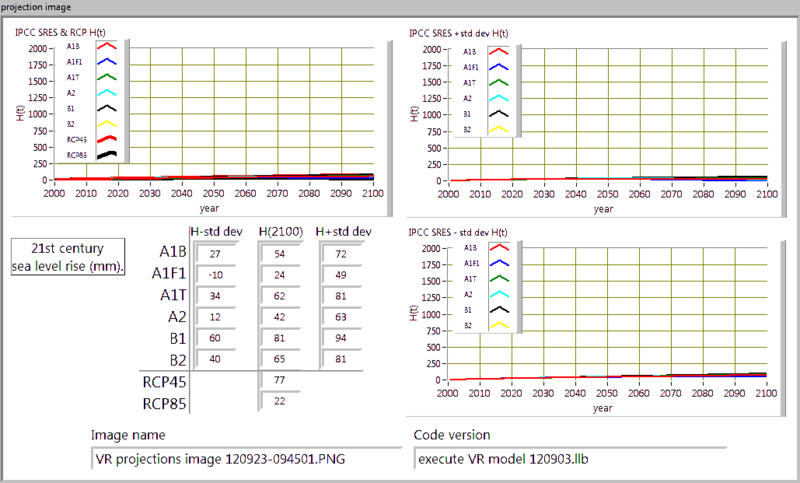 In a previous post I demonstrated that I could reproduce VR2009’s results with my own implementation of their model and the same data sources. Using the same, less accurate sea level data, my results for the model fit parameters a, b and T0 were nearly identical to VR2009’s results, and easily within their margins of error. The point is that I have accurately implemented their model, and to gain credibility when I when I make further claims about it. What happens when VR2009 is applied to the more accurate sea level data? Everything. This is huge. 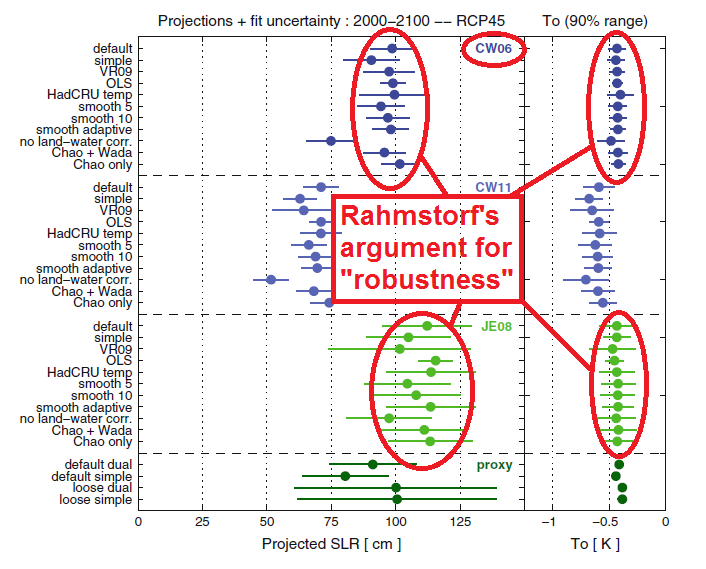 When these numbers are inserted into Vermeer’s and Rahmstorf’s model equation, and 21st century IPCC temperature scenarios are applied, the resulting sea level predictions are half of what Vermeer and Rahmstorf claimed. It is just that simple. Martin and Stefan, I still have a lot more cards to play. All in good time. We are told that sea level rise is one of the more dire consequences of global warming. It is posited as a bellwether to the fate of the planet. So it may come as a surprise to learn that about 25% of the yearly sea level rise comes from pumping water from the ground and adding it to the oceans, not from melting ice. And this percentage has been rapidly increasing since 1950. Mistaking this groundwater as ice-melt-water in calculations designed to ferret out the effects of global temperature on sea level greatly prejudices the calculations toward higher sea levels in the future. 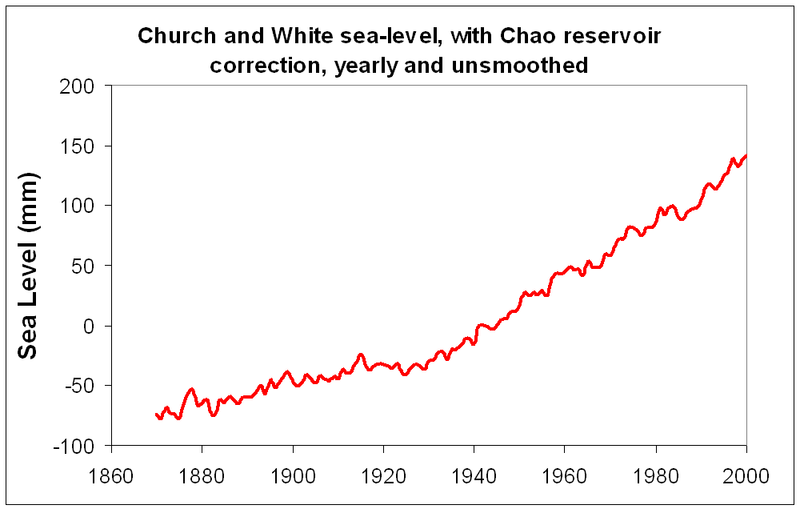 Remember the “correction” to the sea level from Chao that made the sea level rise rate for the second half of the 20th century appear to be higher (surprise, surprise) than the commonly referred to Church and White sea level data (Church, J. A., and N. J. White , “A 20th century acceleration in global sea-level rise”, Geophys. Res. Lett., 33, 2006)? I wrote about it back in May. Martin Vermeer and Stefan Rahmstorf were all too happy to include this “correction” in their model relating sea level to temperature, of which I have written about extensively. Chao’s idea was that water stored in the increasing number of artificial reservoirs built around the world in the last half of the 20th century is water that would otherwise be in the oceans. Therefore, he said, the effect of global warming on sea levels was underestimated, and needed to be corrected by adding the stored water to the sea level. I pointed out that his analysis was both useful and flawed. Useful because he did a nice job of researching the construction of reservoirs around the world and their total capacity. Flawed because he neglected to consider the balancing effect of groundwater depletion. Figure 1. Groundwater extraction cartoon from Environment Canada. Note the "groundwater discharge into the sea" on the far right side of the cartoon. ﻿﻿We have corrected the sea-level data for the reservoir storage component, but a further non-climatic effect of relevant magnitude is the mining of groundwater for human uses in arid regions. No time series of this is available, so it cannot be included in the above analysis…but in recent decades groundwater mining could have contributed 0.2–0.3 mm/year to sea level. We estimate that since the 1960s groundwater abstraction has more than doubled (from 312 ﻿± 37 to ﻿734 ﻿± 84 km3 a-1) resulting in an increase in groundwater depletion of from 126 ﻿± 32 to ﻿283 ﻿± 40 km3 a-1. Most of the groundwater released from storage due to groundwater depletion will end up in the ocean, partly by runoff and, as most of the groundwater use is for irrigation purposes, predominantly through evaporation and then precipitation…We estimate the contribution of groundwater depletion to sea level rise to be 0.8 (±0.1) mm a-1, which is 25 (±3) % of the current rate of sea level rise of 3.1 mm a-1… and the same order of magnitude as the contribution from glaciers and ice caps. The following plot (figure 2) from Wada shows the total number of km3 of water removed from the ground each year (top plot) and the depleted fraction (bottom plot) each year from 1960 to 2000. The depleted ground water is the fraction of the removed water that is not naturally recharged by rain, snow, etc. The depletion rate fits an exponential very nicely. 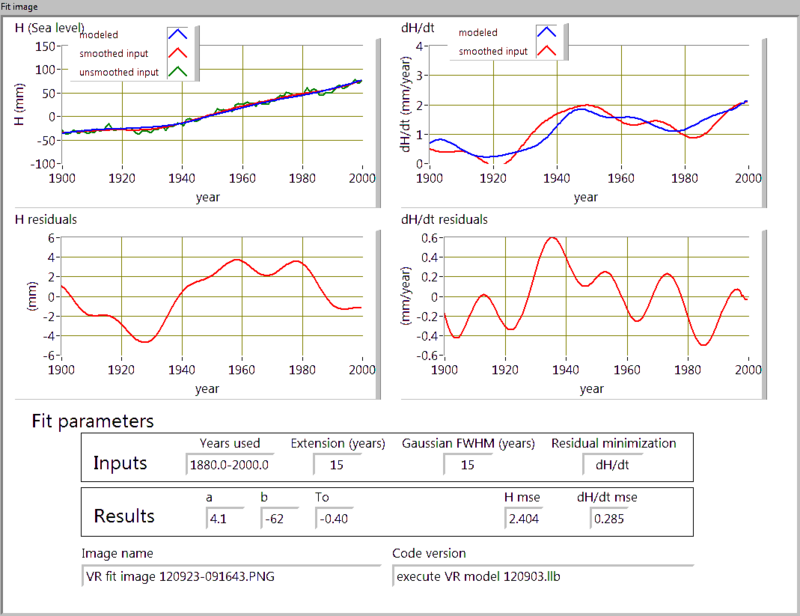 In figure 3 I have digitized the groundwater depletion data from figure 2, ﻿converted it to sea level rise rate in mm ( one km3 of water yields 2.78 x 10-3 mm of sea level rise), and fit it to an exponential (R2= 0.98). and these drivers have all been moving along more or less exponential trajectories for the last century. 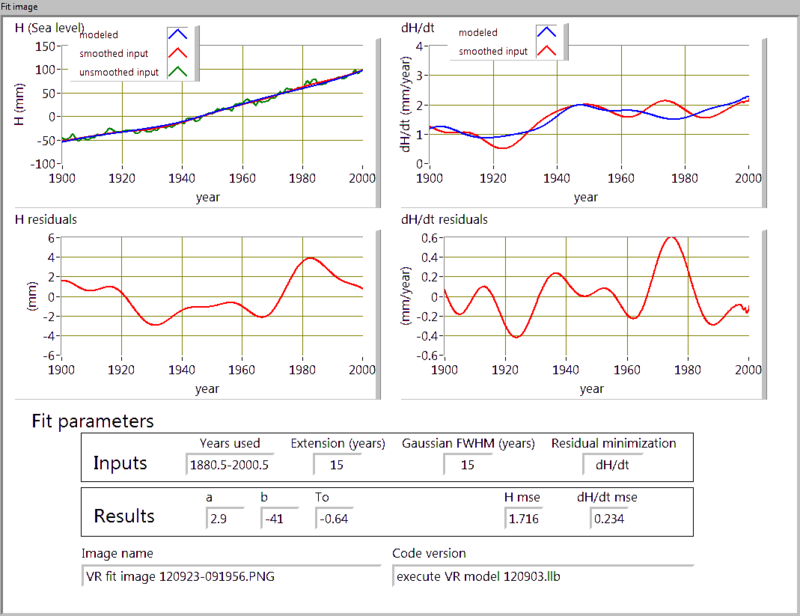 So, in figure 4 I have extrapolated the Wada groundwater depletion back to 1880 along its exponential fit, and overlaid it with the Chao reservoir correction. Figure 4. The Chao reservoir correction and the Wada groundwater depletion correction. 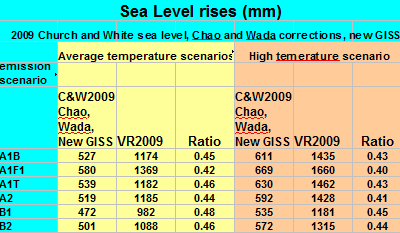 The Chao correction is added to the Church and White sea level data, and the Wata correction is subtracted. 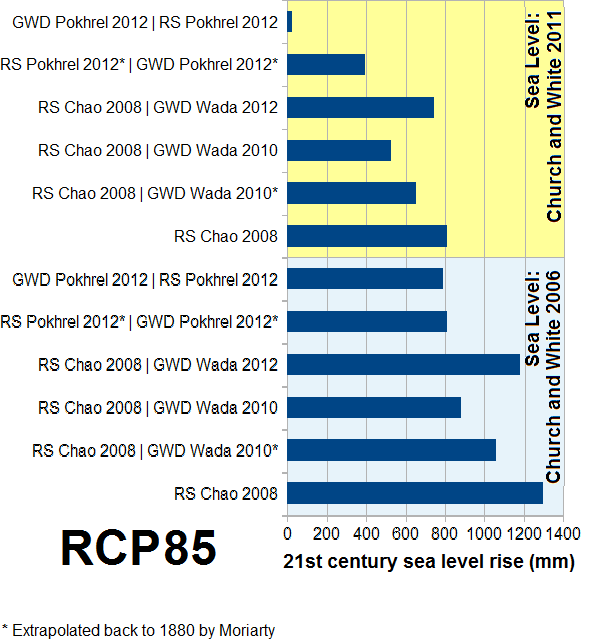 Figure 5 shows the uncorrected Church and White sea rise rate, as well as the Chao reservoir corrected version, and the Chao reservoir plus Wada groundwater depletion versions. Vermeer and Rahmstorf used only the Chao reservoir corrected version. The version that has both the reservoir and groundwater depletion corrections is further divided into two parts: prior to 1960 and after 1960. The pre-1960 data is based on the exponential extrapolation of the 1960 to 2000 data. 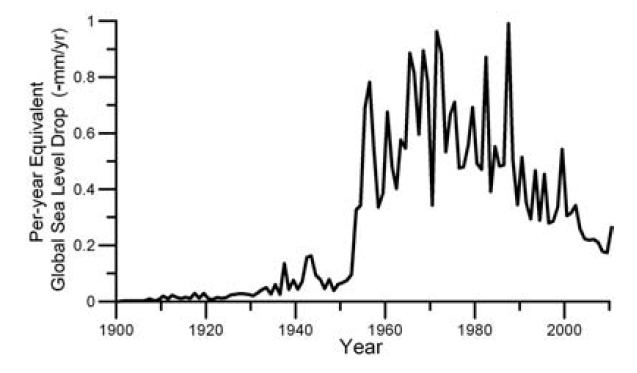 Those who feel incredulous about this extrapolation can simply ignore it – it has no effect on the groundwater delpletion correction after 1960.
figure 5. 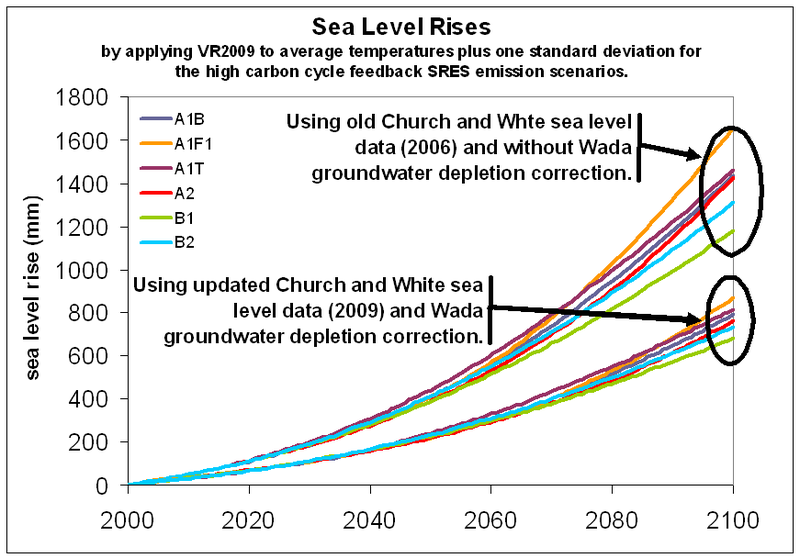 The effect of sea level rise rate corrections. Does the Wada groundwater correction make any difference? 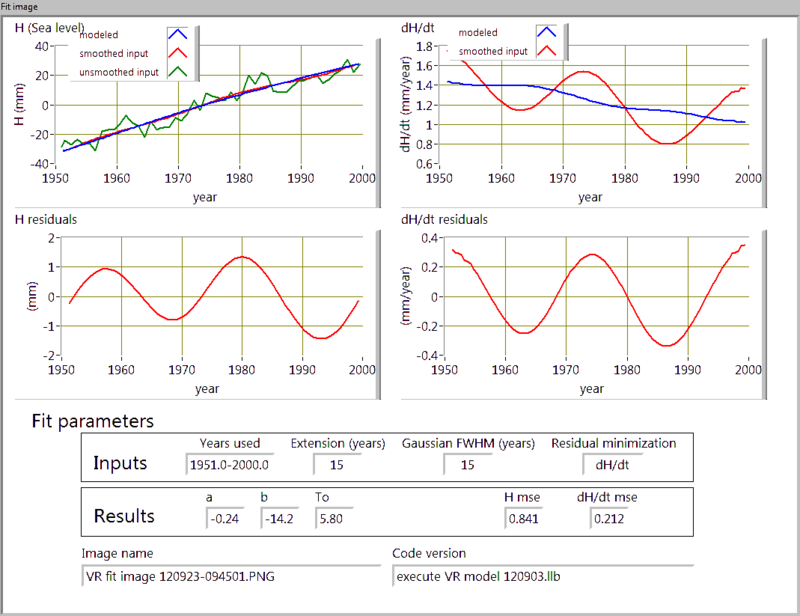 Look at figure 4 and notice that around 1985 the groundwater depletion correction overtakes the reservoir correction. 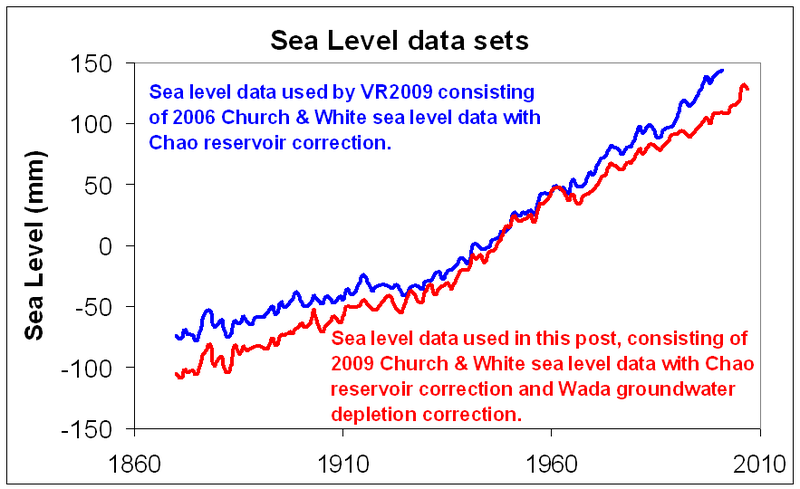 Before 1985 the combination of the two corrections yield a sea level rise rate that is greater than the plain Church and White data, but after that the sea level rise rate is lower. 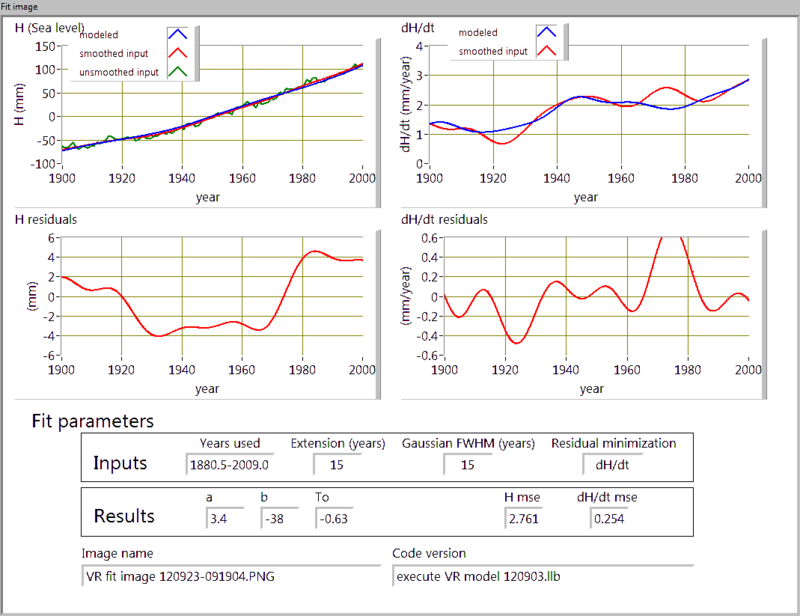 The groundwater depletion data only goes to the year 2000, but if the exponential extrapolation holds, then by 2010 the reduced sea level rise rate will be even more pronounced. figure 6. 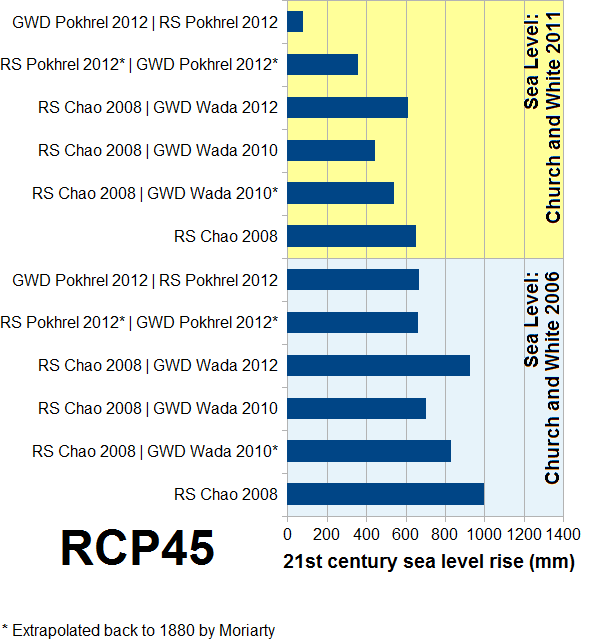 Church and White sea level with Chao reservoir correction, compare to figure 7, below, by clicking both to enlarge. Figure 7. (This is figure 6 from VR2009) The red curve at the lower left corner is exactly the same as the data in figure 6, above, but it is cut off below 1950. Click on each image to enlarge to inspect the details. The following animation gives some idea of the effect of going from figure 6 to figure 7. 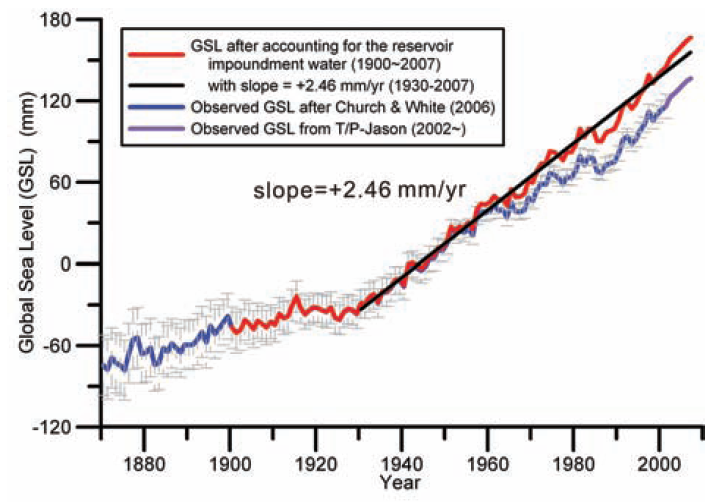 What do you lying eyes tell you about the sea level from about 1930 to the 2000 in figure 6? 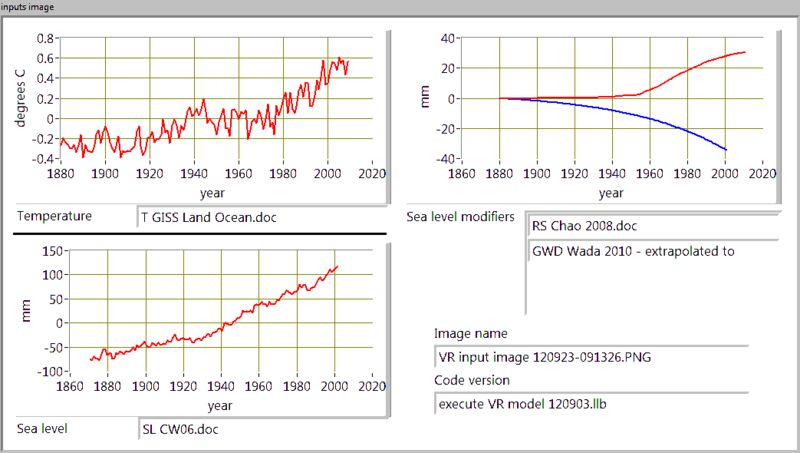 Here is what I see: a sea-level rise rate that does not change much, with a pretty good fit to a line, despite changes to the global temperature. 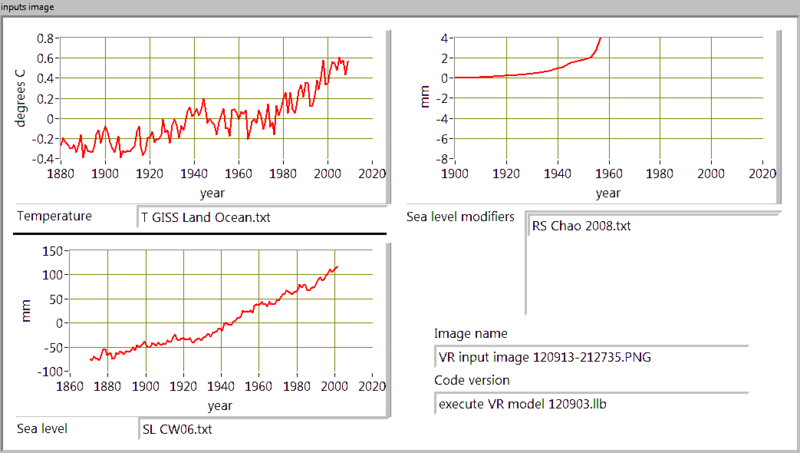 Any significant increase in the future sea level rise rate that can be divined from it must arise from obscure effects that only the most powerful mathematical minds (like Vermeer’s and Rahmstorf’s) can discern. 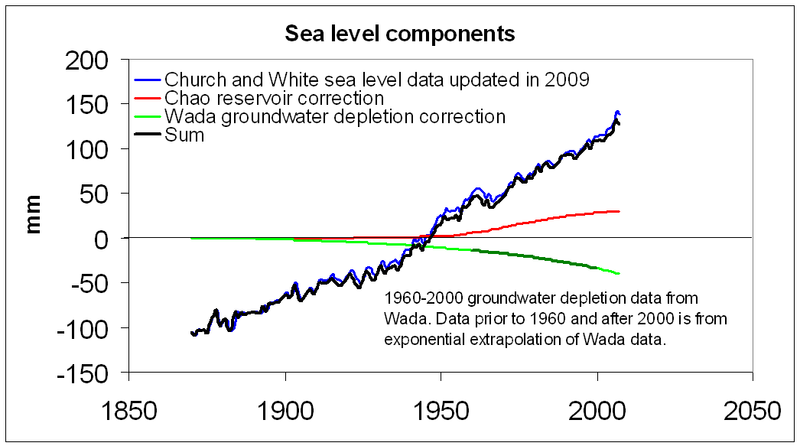 From figure 5 it can be seen that the inclusion of the Wada groundwater depletion correction decreases the sea level rise rate by a not so obscure 20% at the end of the 20th century, compared to Vermeer’s and Rahmstorf’s calculations. 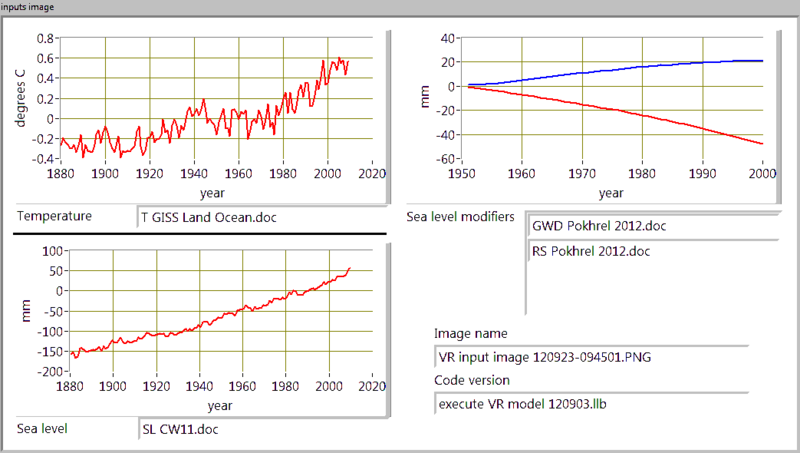 Let’s face it, Vermeer’s and Rahmstorf’s sea-level rise predictions come from the forced confession of innocent data. Every effort is made, no stone unturned, in a quest to wring out as much sea level rise as the most gullible audience will believe. 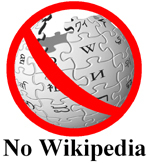 The review and publication of their model by the National Academy of Science stands as a monument to the supreme reign of the global warming dogma. Figure 10. 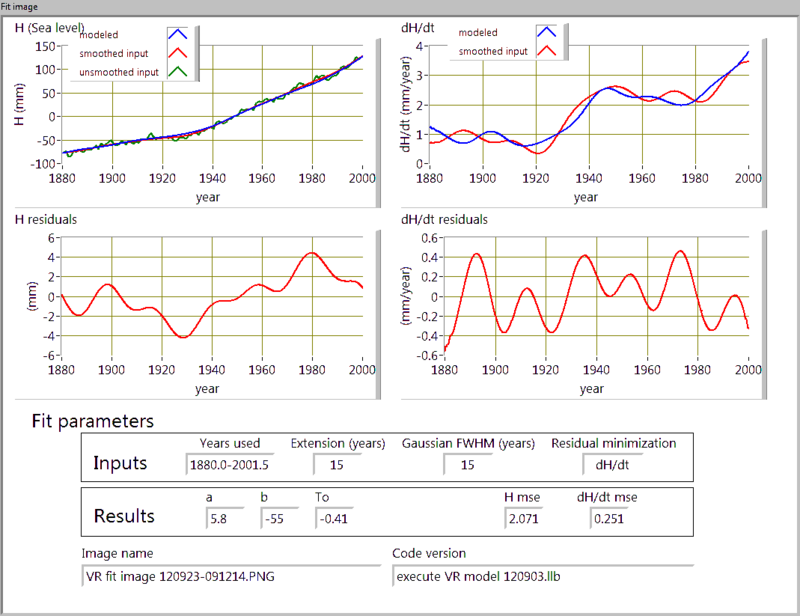 Data analysis - Vermeer and Rahmstorf style. B. F. Chao, et. al., made a useful but flawed contribution to the question of sea level rise with their Science article “Impact of Artificial Reservoir Water Impoundment on Global Sea Level.” The gist of their paper was that all the water captured by man-made reservoirs is water that would otherwise be contributing to higher sea levels. This is an important point, they say, when considering global warming induced sea level rise. They correctly point out that the sea level would be higher if this impounded water had been allowed to naturally flow to the sea. Therefore, they conclude, global warming induced sea level rise is even worse than thought. Read on, and I think you will agree with me that, amazingly, they missed one obvious point. They find that the vast majority of the water impoundment happened in the second half of the 20th century. So, the amount of uncounted sea-level rise in the second half of the century was greater than the fist half of the century. 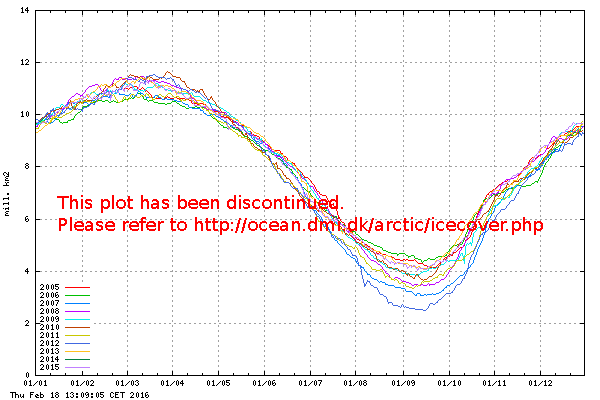 This confirms the alarmist point of view about dangerously accelerating sea level rise rates. What about the opposite effect: depleted natural reservoirs, such as lakes and aquifers? Water that is pumped from an aquifer or lake, but not recharged, ultimately adds to the sea level. This water would mistakenly be considered to be part the sea level rise due to global warming. Ground water depletion has a host of serious ramifications apart from sea level rise. For example the Indian states of Rajasthan, Punjab and Haryana (114, million people, or less than 2% of the world’s population) are depleting their aquifers by about 20 cubic kilometers per year, which may have devastating effects to these important agricultural regions. In the United States (5% of the world’s population) as much as 800 cubic kilometers of water have been overdrawn from the aquifers in the 20th century. In just 40 years the Aral Sea in central Asia has shrunk by nearly 1000 cubic kilometers (as this very nice interactive web page illustrates). The University of Wisconsin’s Professor J. Van Klump estimates that the yearly global ground water overdraft is 200 cubic kilometers per year!! This would account for over half a millimeter of sea level rise per year (“200 cubic kilometers” x “2.78 microns sea level rise per cubic kilometer“), and entirely counteract the effect of artificial reservoirs. So, Chao made a useful contribution to the understanding of sea level, but his sea level correction was fatally flawed because he neglected the counter-effect of ground water depletion. Why wasn’t this point obvious to Chao, et. al.? My guess is that I am not the only one who thought about ground water depletion when reading about Chao’s artificial reservoir water impoundment and its effect on sea level. It is hard to believe that it did not occur to Chao, et. al. It seems quite simple and obvious. Their paper would have been more scientifically accurate and useful if it had not neglected ground water depletion. The only conclusion I can draw is that the prevailing alarmist view of the day makes it easier to get a paper that inflates sea level rise rates published than a more complete paper that does not. A new Geophysical Research Letters paper (﻿Wada, Y., L. P.H. van Beek, C. M. van Kempen, J. W.T.M. Reckman, S. Vasak, and M.F.P. Bierkens (2010), Global depletion of groundwater resources, Geophysical Research Letters, in press) confirms my estimate (and more). In fact, Wada’s data shows the effect of ground water depletion at the present time to be GREATER than the effect of artificial reservoir storage.